It’s Monday and another edition of the Food Matters Project. I’m a little late in my post, but it has been hard to get behind the stove and cook when it is soooo gorgeous outside. We had nearly six days of straight drab and dreary rain and then the sun popped out this weekend in full spring fashion. It was grill action time! Unfortunately, that means I put off my Vegetables au Vin with Coq recipe from the FMP. It was chosen by Evi + Sam of the Fifth Floor Kitchen blog. It is the chicken and veggie version of Julia Child’s Beef Bourginogn, my ALL TIME FAVORITE INDULGENCE DISH. Although I love love love that dish, it takes a friggen lifetime to make. 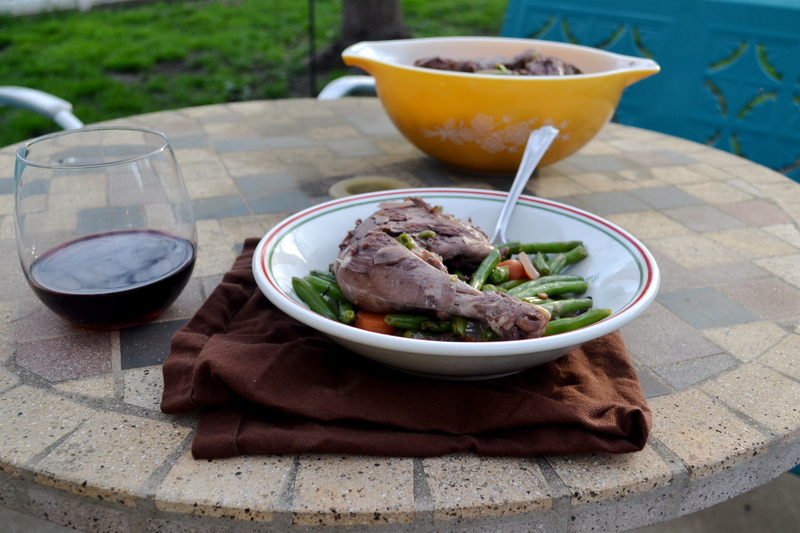 Mark Bittman’s Vegetables au Vin with Coq takes a fraction of that time, clocking in at 40 minutes to an hour. 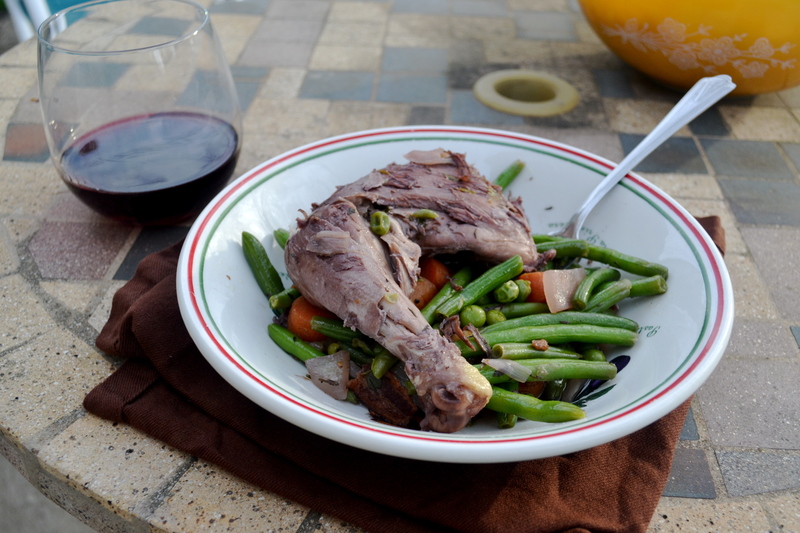 In his recipe, he uses eggplants, mushrooms, onions, and green beans along with chicken and braised in a red wine sauce. I love recipes that allow me to drink while I cook. 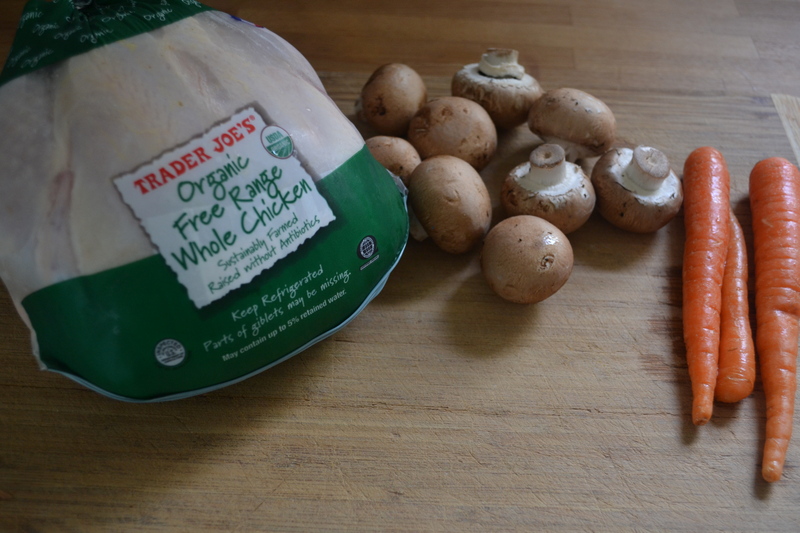 My version uses a whole organic farm raised chicken ($2.50 to $3.50 per pound) which is cheaper than buying organic chicken breasts ($6 to $7 per pound). Use a good pair of kitchen shears to cut the bird up into 4 pieces (breasts and thighs). Save the wings, neck, back, and other parts to use in making homemade chicken stock by throwing those parts in a crockpot, filling with water, adding some carrots or celery for extra flave, and turning on low to cook overnight. Bam…homemade stock. Instead of eggplant, I stuck with carrots, celery, mushroom, onions, green beans, and spring peas. 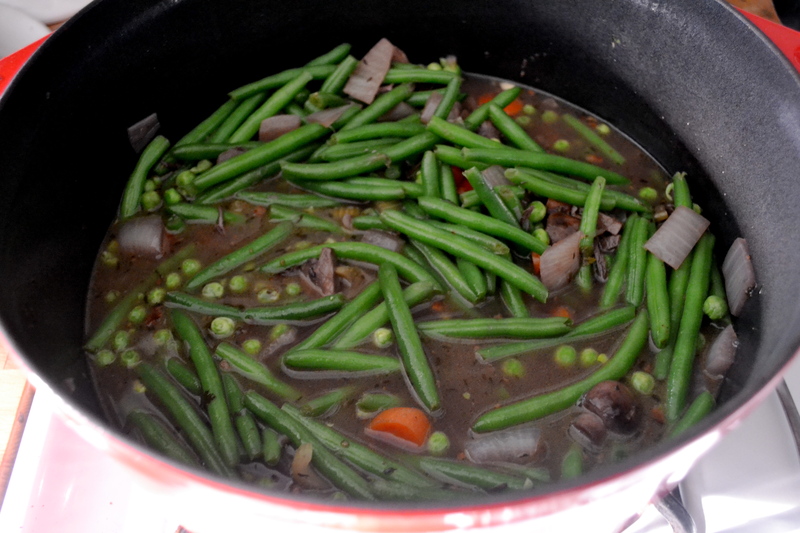 Because green beans and spring peas do not take long to cook, I add them at the very end so that they aren’t mushy. Use a fruity wine, such as Pinot Noir. In a Dutch oven or large pot, add 1 tablespoon of olive oil and heat over medium-high heat. Add the chicken, turning and rotating as necessary. Once all sides are browned, remove the chicken from the pan. Add the rest of the olive oil, onions, carrots, celery, and mushrooms. Cook the vegetables for about 15 minutes, stirring occasionally, until they being to turn brown. Stir in the garlic and sauté for 1 to 2 minutes. 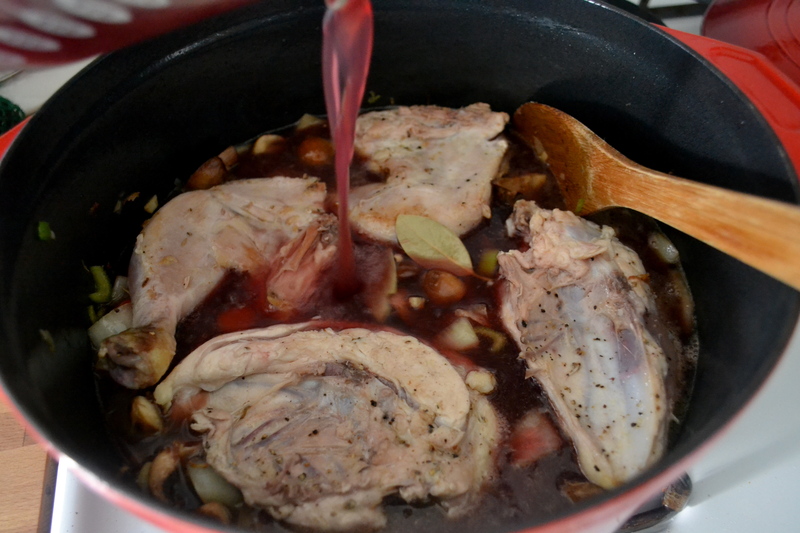 Add the stock, wine, bay leaves, and herbs. At this time, return the chicken to the pot. Bring the liquid to a boil, then lower the temperature and allow it to cook for about 20 minutes. The chicken should be cooked through at this point, if not, cook for another 5-10 minutes. Remove the chicken from the pan and add butter to the liquid. Allow it to cook until it is reduced by half, and becomes saucy and thick. Add the green beans and peas. Cook for about 5 minutes. Sprinkle in pepper, or any additional salt. Remove the bay leaves. If you’re making this dish ahead, refrigerate it at this point. If you’ll be eating it soon (or when you’re reheating), then add the chicken back into the pot and allow to warm up for about 5 minutes. Garnish the dish with parsley when serving. Nice – I love how you left your veggies crisp and just cooked! Better late than never 🙂 Your dish looks beautiful, very springy indeed!